Painter of historical subjects, genre scenes, portraits, (local) figures, landscapes and sporting subjects; designer of church and theatre decorations. Gustave Claude Etienne Courtois was a pupil of Jean-Léon Gérôme at the Ecole des Beaux-Arts in Paris. He designed large decorations for churches, the town hall of Neuilly-sur-Seine and the foyer of the Odéon theatre in Paris, where he depicted the famous figures of Lisette and Figaro. His works include: “Bayadère”, “The Burial of Atala”, “Human Anxiety” and “Isynka, Countess of Rochetaillée”. In addition to portraits, Courtois also painted landscapes of Franche-Comté. He trained numerous pupils. Courtois exhibited at the Salon de Paris, receiving a third-place medal in 1878 and a second-place medal in 1880. He was awarded a gold medal at the Exposition Universelle in 1889 and exhibited at the Salon de la Société Nationale des Beaux-Arts from 1911 to 1914. He was made a Chevalier in the Légion d’Honneur. 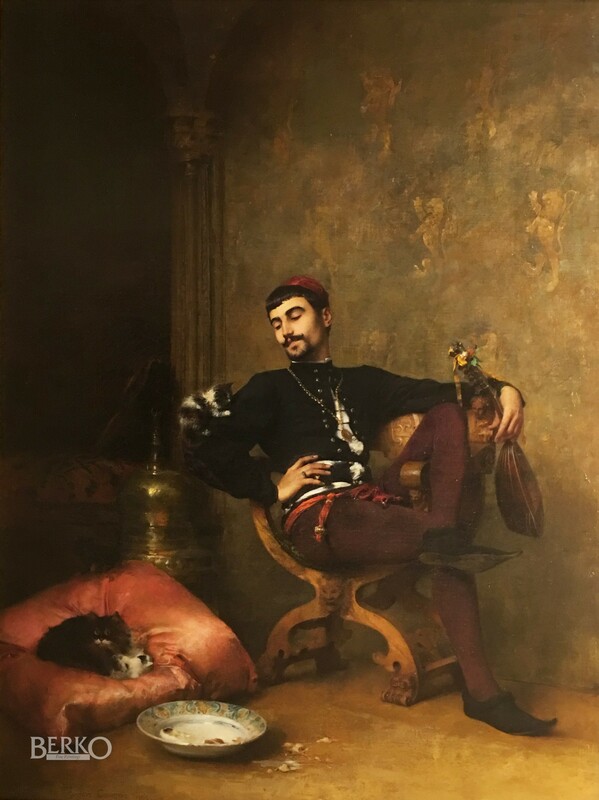 This specific painting has been exhibited at the Exposition Nationale des Beaux-Arts of 1882. E. Bénézit, "Dictionary of Artists", Paris 2006, Vol. 4, p. 81-82.